"..,Dave played things so close to the vest, when I asked him questions at the "My Awesome Gaming Group" panel, he answered my "is it this or that" question 'yes' because 'some of my players are here'" Tavis Allison, commenting on the 'blog Beyond the Black Gate Monday, July 25, 2011, "Dave Arneson and Impartiality in the Temple of the Frog"
"To be honest, I never had a character sheet. Dave A. had my character (Svenny) on an index card that he kept. He let me use it during a couple of game sessions (maybe 2 or 3) but always collected it again. I never thought to make a copy of it, either." Greg-Svenson, Post subject: Re: Megarry's Blackmoor Characters Posted: Oct 24, 2016 5:08 pm Comeback Inn forum. If you are an OD&Der, it is only natural for you to be looking at Megarry's characters for signs of familiar stats, but you will be hard pressed to find them. A few of the "ability scores" are there, albeit in 2d6 instead of 3d6, but the all familiar hit points, level, saving throws, etc., of the D&D are conspicuously absent. Is this because these things were not a part of the Blackmoor game? The answer to some extent depends on the particular stat. In fact, while there seems to be a lot missing from the sheet, we can be certain nonetheless that there were some items of character information, that the players weren't allowed to know. As the quotes above show, Arneson prefered what we might call an immersion game, with as little "out of character" talk as possible. "How did it all start in Blackmoor?..... I was also quite tired of my Nappy campaign with all its rigid rules, etc., and was perhaps rebelling against it (in fact I'm sure I was!!)..... (For Blackmoor) rules were actually written down (but closely guarded by the referee and subject to change without notice if things got out of hand)." Different Worlds magazine, June/July 1979, p6-7. Given the context, it is pretty easy to see what is going on with Dave Megarry's character sheet. Arneson apparently preferred to keep important rules details out of the hands of his players, including things that we would now think of as a part of character information. The information the players had about their character was not the whole picture. Hit Points are perhaps the most obvious omission. We might also expect to find Hit Dice, Level, and Experience Points. Despite not being directly referenced on the character sheet, we know these things were a part of a characters makeup. Hit points and experience points are discussed in this POST, for example. That post references Greg Svenson notes in the back of his 2nd edition CHAINMAIL. Svenson had these notes, no doubt, because he was one of the first persons Arneson turned to with help refereeing Blackmoor adventures. It was "need to know" information. There's a bit more to be said about experience points, however. Although it is true there is no XP total listed, Megarry does keep track of the monsters his characters have killed, and in the single case of the Scholaress character, he also writes their point value. Which tells us at least something about the characters earned experience (more on this in a later post). Academically, this is all kind of interesting (to me anyway), but imagine for a moment, if Arneson's approach had become the norm for D&D. Imagine character sheets where the only statistical information a player has is their ability scores, saving throws, armor class, and maybe their level. It is the referee, not the players, who track the characters hit points and damage, experience points, and other "rulesy" type information. So, you don't know what your hit point total is, or how much damage exactly (in points) you can do. You don't know how close or not you might be to leveling up. You probably don't know how much of a bonus that magic weapon has either. Descriptions of action, especially of fights, would naturally be less laced with statistics and mathematics. Instead of "You take 4 points of damage" it would necessarily come out as "You receive a deep gash and your character is feeling very weak." or some such. One wonders what direction D&D would have developed in if the D&D player's character information had been limited in the same way it was in Blackmoor. The mystery of the circle and squares. It's hard to see in the pics I copied to the blog so here is a link where you can download better resolution jpegs. So to reiterate, the "circle numbers" came first, at the time the Hercebeiner characters were created. Then came the square numbers, and Megarry drew circles and squares around them to mark them as different. Before your mind goes racing to all the obvious D&D stuff, take note of the zeros, and keep in mind the ranges found on the 2 sheets; square numbers range from 0-4, whereas circle numbers range from 0-7. I suggested to Mr. Megarry that if it was from CHAINMAIL, then the numbers were probably no armor = 0; shield only = 1, leather armor = 2; chainmail = 3; plate armor = 4., and Dave Megarry thought that was probably it. The puzzling thing about that is that it skips the "with shields" columns, so why use these numbers? I mean, if you are just counting across on the Man to Man table "3" is leather and shield, not chain. So it would seem to make more sense to just write "chain" or to number across all the column so as to avoid confusion. I also wondered if the circle and square numbers could both be armor class, like ascending vs descending, but the circle and square numbers do not correspond in any way that would allow them to be describing the same sets of armor, therefore, if they both represent a defense number of some kind, and the square numbers are a shorthand for CM armor types, it would seem that the only real option for the circle numbers would be helmets, or possibly shields. Of course, there is no table in CHAINMAIL for shield types or helmet types - so if the numbers were intended to be a separate armor rating for either shields or helmets, Arneson would have to have created his own tables for them. That seems a bit fiddly, and there is no evidence for such. Also, when we look to the FFC, we find three kinds of helmets and 9 kinds of shields (three kinds of small, medium and large). Since our number ranges in the circle and square figures are 0-4 and 0-7, helmets clearly don't fit the range. Shields however remain a possibility for the 0-7 range of the circle numbers, but this again is problematic. Yes, shields are already included on the Man to Man table, but it is conceivable that Arneson developed a shield rule like that found in the Dalluhn draft and in somewhat different form in the 3lbb booklets; namely that a magical shield would only "catch" a fraction (like 1/3rd) of the blows depending on the direction of the attack. However, even this idea doesn't stand up well to scrutiny. The numbers can't be a separate shield rating within the Man to Man method because the number combinations on the character sheet don't correspond in any meaningful way. Remember also that the circle numbers came first. What sense does it make, for Arneson to have switched from a single "to hit" target number to determine a hit on a character, to a wholly unknown to hit table based on whether a character has a shield or not? Well it doesn't. About the only way it could make sense was if the circle numbers were a shield 2d6 saving throw number. If a saving throw based on shields came first, then it might make some sense if armor were added in the manner Megarry suggested (no armor = 0; shield only = 1, leather armor = 2; chainmail = 3; plate armor = 4) because then the "with shield" column on the Man to Man table would be redundant. Then again, type 1 "shield only" would seem to be redundant too. There are two bits of circumstantial evidence that might support this; namely there is an "X5" shield, otherwise unexplained, in the treasure of the original Temple of the Frog (First Floor, Room 4, p37) and a cryptic comment in the FFC that "...the player received a "Saving Throw" against any hit he received." (1977:2). Both are rather thin sauce, as the first might be a typo and the second doesn't seem to have any dependence on possessing a shield, but who knows. Perhaps the only way it could make sense for the circles to represent shields and the squares to represent armor is if the numbers have nothing to do with the Man to Man table, and are instead "ablative" armor, like that found in the original Temple of The Frog and Craig Grasteck's "Rules to the game of Dungeon". This type of armor will absorb a number of hits until it fails. Honestly though, there's very little evidence for this type of armor in early balckmoor. Further the numbers don't really fit well. If the circles represent shields, then shields are significantly better than body armor according to the numbers. They also don't come anywhere close to the number of hits the one known example found in the 1975 TotF. That suit of armor could take 65! hits. True it was space alien technology, but it is still a tremendous gap between the 2's and 3's we see in the circle and square numbers and 65. My last, best guess is that the circle numbers could represent an attack bonus, possibly also applicable to saving throws and such. If you'll remember a good while back when I discussed Pete Gaylord's character sheet, there was an unexplained "+5" written next to his best weapon, the pole axe. At that time I pointed to the "Blackmoor Military Manpower Distribution" list (FFC 1977:17), where following each Player Character, their Hit Dice are listed, and many of them include a bonus ranging from 1-5, though only Svenny has +5 and the rest are +1 or 2. Maybe the circle numbers are this sort of bonus. Squares: These numbers represent armor class corresponding to the Man to man table in CHAINMAIL. They range either 0-4 or 0-7.
l'm afraid I have to leave it at that until more information becomes available, but feel free to speculate in the comments. After several attempts that came back with unsatisfactory covers, I received a proof copy today of The Book of Elder Magic in softcover that came out great. So I've been so engrossed (gaming time wise) with the study of Dave Megarry's character sheet that I failed to notice until yesterday that the latest issue of & Magazine has been released. I mention that here because within the pages of that sterling issue is an article I wrote titled "Setting up a Proper Dungeon." This is a substantially updated version of the article I gave out to Champions of ZED backers several years ago. If you are not familiar, & Magazine is a terrific source of old school gaming goodness. Check it out. Note: Bolded/italicized weapons are those of the more limited list on Megarry's second sheet. The order of items generally follows Gaylord's with some rearrangement for convenient comparison. Previously, I've discussed Pete Gaylord's character sheet in a short series of posts (please see Character-Sheet-Clues Character-Sheet-Clues-part-II and Character-Sheet-Clues-III ). Now that Megarry's character sheets have been made available, we have a basis for comparison. One of our first concerns is relative dating. It appears that Gaylords sheet may well be slightly older than Megarry's. Although, as showh in the above table, they are very nearly identical in the listed characteristics. Gaylord's character was a wizard and contains information on level and magic not on Megarry's sheet, so we will set that information aside for now. Of greater significance may be the circle and square numbers mentioned in point three in yesterday's post. Gaylord's sheet lacks these circle and square numbers, therefore seemingly placing the sheet at a time prior to Megarry's Hecebeiner chracters. Admittedly, the circle and square numbers may have been irrelevant to a wizard, and so must be viewed with caution as a dating tool. However, Gaylord's sheet also lacks a Miscellaneous category, which we know was added to Megarry's. It is therefore almost certain that at the least, Gaylod's sheet dates prior to the creation of the David "Diamonds" Balfour character. Further, note that Gaylord lacks Loyalty, but has "Credability". Loyalty is a trait we see mentioned in the FFC and is well known even in D&D. I suggest that it is more likely for Credibility to have been dropped and Loyalty to have been added than the reverse. 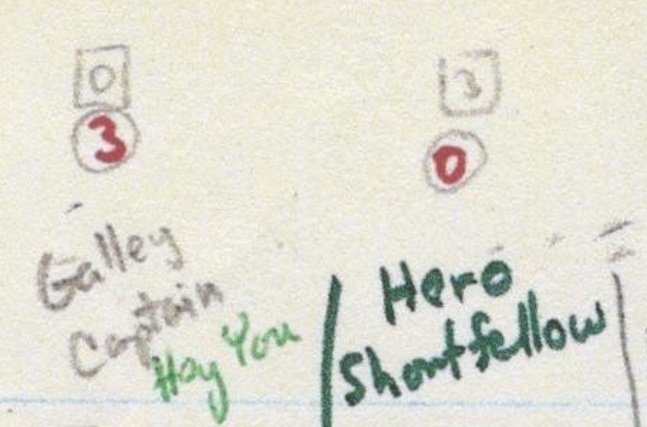 It is likely also significant that on Megarry's sheet, Halbard is spelled correctly, "stone" is missing, and a new weapon "bow" appears. The correctly spelled "halbard" in particular may indicate that Megarry's character sheet follows the publication of the second edition of CHAINMAIL in July of 1972, because the spelling in Gaylords sheet, "Halbear" copies a misspelling found in the first printing of CHAINMAIL. Of course, it is also quite possible that Mr. Megarry simply corrected the spelling himself. Notice on the above table I've included an AiF column. Primarily, this was done as merely a useful reference and example of the extent to which AiF does, and does not, conform to the original Blackmoor game. There are 14 "non-weapon" skills on Megarry's sheet compared to 13 on Gaylords. Eleven of these are shared in common. The odd traits out are Credibility and Cunning on Gaylords sheet, and Throwing, Loyalty and Miscellaneous on Megarry's sheet. What remains is a core of 11 common "ability" or "non-weapon" traits, utilized reportedly and apparently as 2d6 roll under saving throws.